A bid to sink an old battleship off the Dorset coast to create an artificial reef is still a reality, the group behind the proposals has said. Weymouth and Portland Wreck to Reef wants to source and sink a ship off Ringstead Bay to use as a dive site. It wants to lease the seabed from the Crown Estate, but the estate can only sign a contract with a statutory body. The two parties met on Tuesday to try to discuss a way forward for the project. 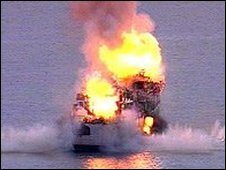 The plan would see a Castle Class Falklands patrol vessel sunk one mile (1.6km) south of the bay in a 247-acre (1 sq-km) area. Neville Copperthwaite, project leader of Weymouth and Portland Wreck to Reef, said the meeting was "brilliant for us, much better than we thought". "Both the Crown Estate and the county council have made a raft of compromises about negotiating about taking the lease on," he said. "The Crown Estate is not being so stringent on the lease part and the council is not being so fearful now of any potential liability." He said the council would now submit a new report to the cabinet and another meeting would be held. Weymouth and Portland Wreck to Reef, a not-for-profit organisation, believes the wreck would re-energise the struggling diving industry in Dorset and help boost the local economy. A Dorset County Council spokeswoman confirmed the project had been turned down at the last cabinet meeting. "However, [cabinet members] asked officers to continue discussions with the company and other interested parties to investigate whether any alternative arrangements could be made to help overcome these problems and carry the project forward," a spokeswoman said. She added it had been estimated the project could generate a potential £1.2m for the local economy each year.